Several days ago I wrote that we planned to go down through the Fenny Stratford stop lock immediately ahead of our mooring. Adam (nb Briar Rose) left a comment mentioning we would be going up rather than down and it wasn’t a stop lock. Adam thought the lock might have been required because “someone” got their water level calculations wrong. Today I was reading that the lock was built to reduce the water pressure in the long pound between Cosgrove lock on the north side of Milton Keynes and Stoke Hammond Lock on the south side. The long sump pound has at least one spillway and so I can’t see how there could be too much water in the pound. I suspect Adam’s suggestion is more plausible. There is a significant leak somewhere in the pound above the lock. CRT are back pumping water all the way back to the pound above Soulbury 3 Locks because of the stoppage at Leighton Lock. Walking the towpath often leads to sights that might pass unnoticed when boating. On today’s walk I came upon three different types of canal markers. This one was just a baby hiding in the grass and I nearly tripped over it. 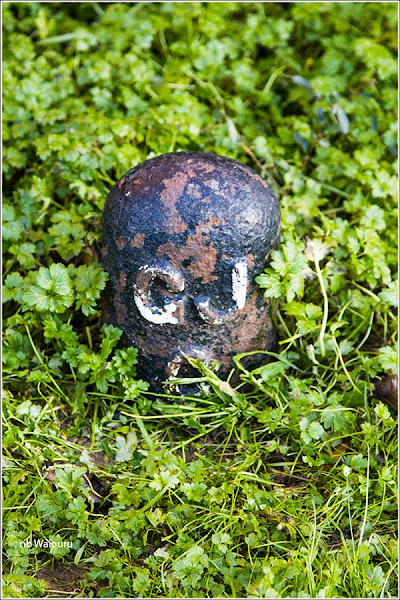 GJC is obviously the initials of the Grand Junction Canal which was the former name of the Grand Union. I assume it became the Grand union when a number of different canals were combined, or united! I do wonder what purpose it serves? 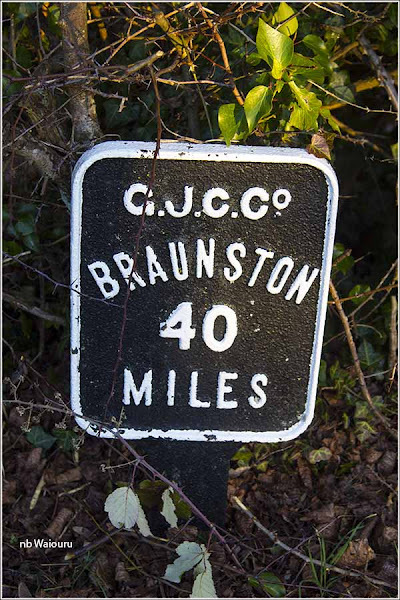 Meanwhile, this is a more common canal marker. It’s taken us almost two weeks and we’ve moved the amazing distance of 40 miles! Now I haven’t seen one like this before. Rather quaint! If you re-read my comment from the other day, you'll see I mentioned the water pressure theory as well as the surveying mistake one! Yes, you are correct. My omission! I should have included the fact you had mentioned the water pressure theory. Now I have read the lock was the result of leakage and the lowering of the pound. This dates back to Grand Jct. Canal days. Just looked it up it was 1802. In 1838 they considered a scheme to raise the long pound by 6" and deepen the pound 3 miles south to stoke Hammond but the cost of work and delay to freight put paid to that scheme and today you still have the lock. Don' t you just love the history of where we live. Your GJC in the first picture marks the boundary of the canal company's land. 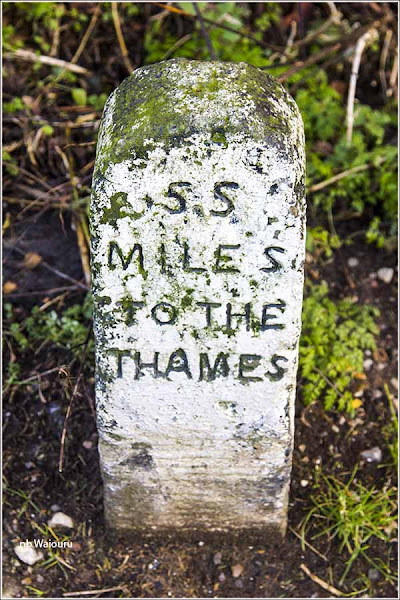 The Thames one has been covered in vegetation for years and as it seems to have now been revealed I am very jealous having looked several times over the years.